The Sodis Method: The sun, plus a plastic bottle of water, for six hours. sun, (Ultraviolet-A, longwave, 315-400 nm), will eliminate most harmful bacteria, parasites, and even viruses from water if given enough exposure to the sun. 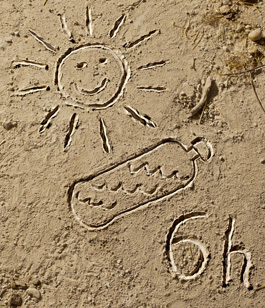 Understand that sunlight will kill pathogens, but it will not remove chemicals. The water to be purified must be clean and free of harmful chemicals. Simple pre-filtering through a small sediment filter can be helpful for cloudy water, but some form of carbon filtration will be needed it the water is contaminated with chemicals. 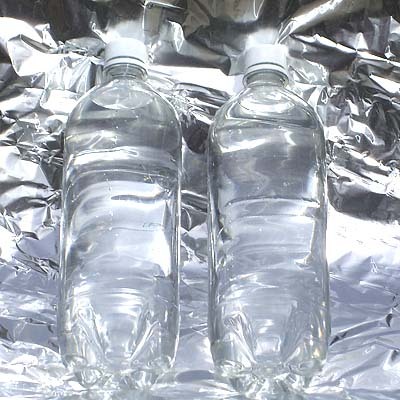 The easiest way to treat water with sunlight is to simply put it into a very clean and clear plastic bottle–PET is preferred–and place it where it can get at least 6 hours of direct sunlight. Temperature doesn’t matter, and the process can work even on cloudy or partly cloudy days–it just takes longer. If it’s cloudy half of the time, allow at least two days for treatment. Six hours of good sunlight can achieve a 99.999 percent reduction of such nasty items as E. coli, vibrio cholera, salmonella, shigella flexneri, campylobacter jejuni, and rotavirus. Of the cysts common to lake and river water, giardia can be eliminated in the six-hour exposure, but it is recommended to treat for at least 10 hours for cryptosporidium. The plastic water bottle should be no bigger than 3 liters. In moderately cloudy water, UV-A will lose 50 percent effectiveness at a depth of 10 mm (about 0.5 inch), whereas UV-A will only lose 25 percent effectiveness at a depth of 10 mm in clear water. Just use a typical size soda bottle or water bottle. Use PET bottle. The water must be clean and clear. Six hours of direct sunlight is enough. A reflective background increases the UV dose. More information about water filters for emergencies: “Emergency Water Filters,” from the Pure Water Occasional. See also on this site.